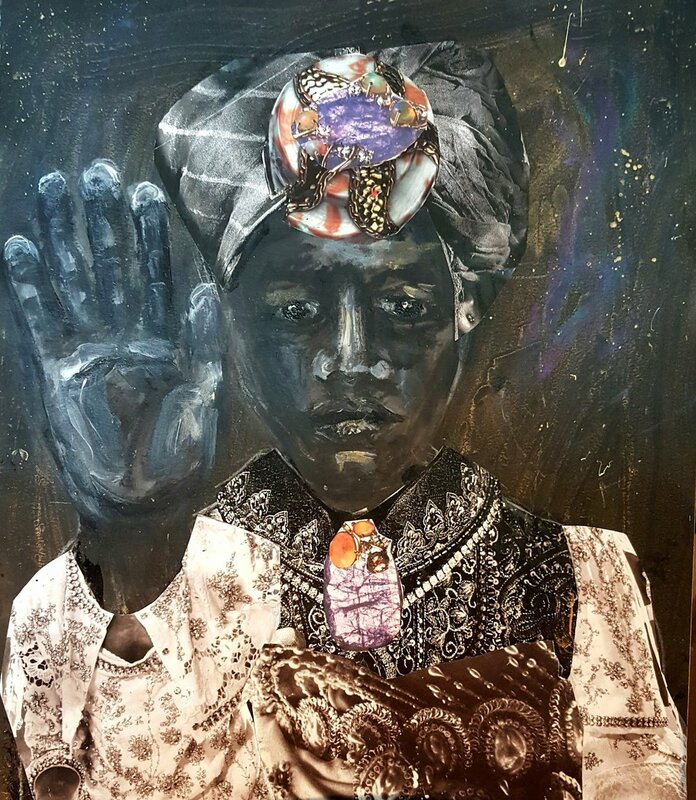 A beautiful thing happened at the art fairs and it was meeting Courtney Alexander, visual artist and the creator of Dust II Onyx: A Melanated Tarot Deck. I met her in one of those 'nothing is by accident' moments, while sharing the entrance to a booth at Volta. Having separate conversations with folks, she had a shimmer about her in an emerald green dress and head dressing, she seemed so familiar. I pardoned the interruption and asked if she was a poet that I recently met after Doreen Garner's Art21 premiere at Ace Hotel. Before long I was getting to know all about Miss Alexander and why she was here. 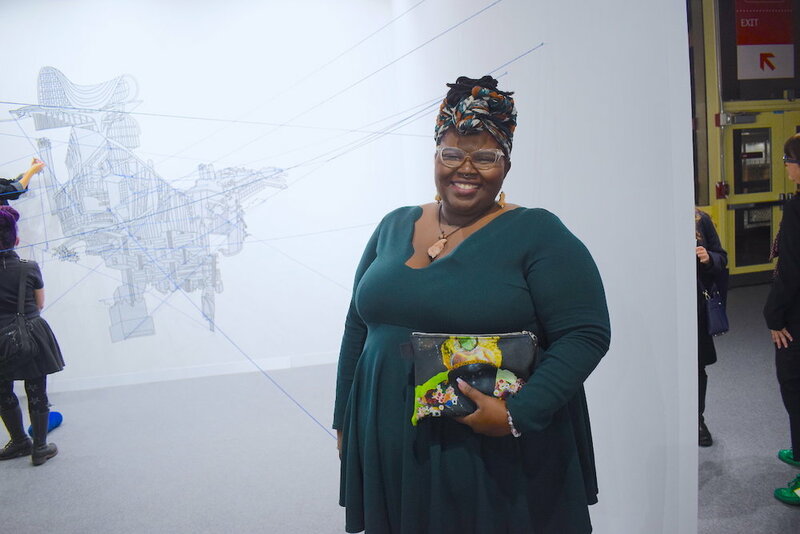 The 2015 USF Studio Arts graduate, carried with her a purse of sorts—a clutch, and it was something she visibly held with utmost care. Inside of the bag was a set of melanated Tarot cards, made by her. Out came the cards, and behold something to be treasured was revealed. 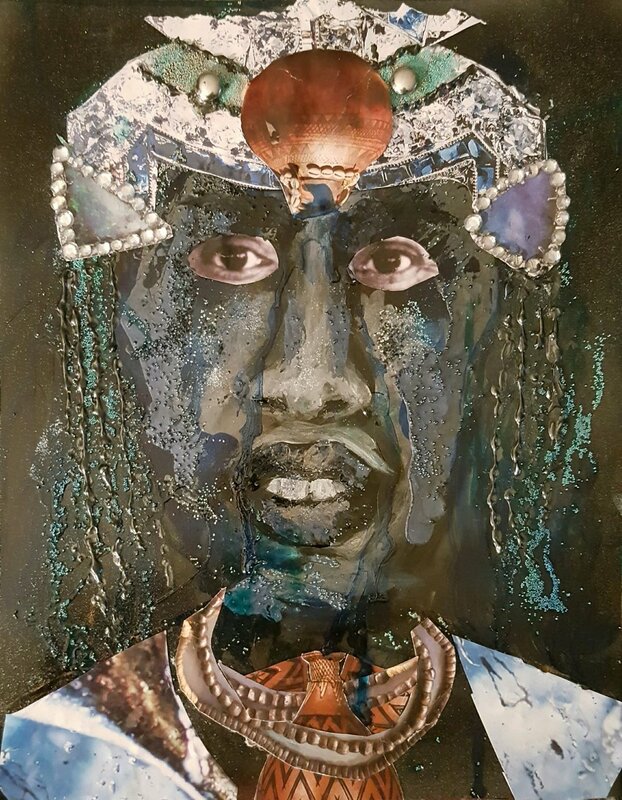 The deck features 78 mixed media collage paintings 'accented with metallic and holographic foils, featuring cultural myths, symbolism, history, and icons within the Black Diaspora,' according to the Deck's website and are giclee prints. Alexander came up from Florida for art fair week on a planned whim. If there is any one piece of obvious advice that should be given to an artist, it is that you have to get your work seen. How you go about it will make all of the positive difference. Courtney took a plane with little more promised than trust that something good will come of it. And that's no small task, to say the least when you're 100s of miles away from New York City and the artists you admire from afar, appear just that, far off and out of your reach. It was all a bit overwhelming for her at first. Meeting Mickalene Thomas and Racquel Chevremont at their Volta curated section, "The Aesthetics of Matter", was certainly a highlight. As a woman confidently exploring the constructs of her intersections, that particular essence is all up in the presence. She is magnetic, with a smile that could lure the coldest of art participants. It's a useful social-magic touch that I often impart myself. It was extra imperative that she not find her self in a quiet observer comfort zone. It was crucial that she be a participant. 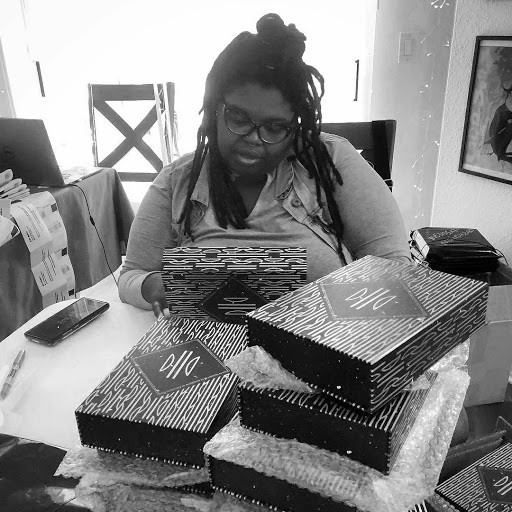 After all, she has launched her second funding campaign for the 2nd Edition print of her soon to be broadly known Melanated Tarot Deck, Dusk II Onyx. The promotion of this project was her reason for being here. As hard as the New York art world is, one must trust that if you are doing the authentically good, we will come to your aide. Which is also something that I must constantly put my trust in. Also, trust that it will still take you a considerable amount of effort in contrast to 'ready-to-hang' works of art and projects... over the couch, next to the fireplace mantle. But where in this big picture of art does a tarot deck belong? However a Melanated Tarot Deck? That then brings us into the realm of black is good, black is magical, black is of deep spiritual roots and traditions that most of us with African heritage is long since severed from. Personal relationships with many of these traditions are probably irrecoverable. Step-aside while we take the time to explore and build a renewed relationship with our blackness. To consciously put ourselves, our blackness, in the story of divinity with intentionality. As Alexander has said, the work "challenges respectability politics within black culture." 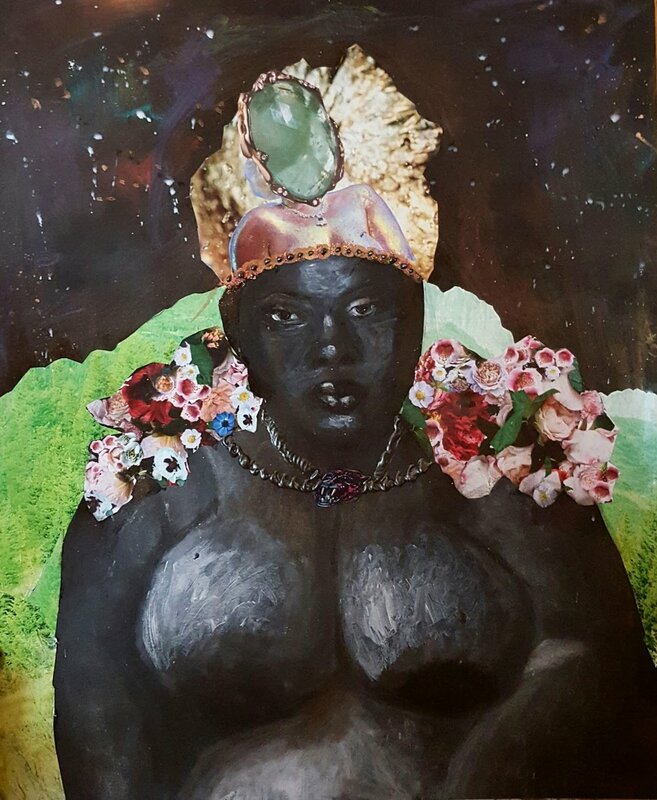 Looking at the artist's past work, mysticism plays an intentional role as she explores the many intersections of her 'ness, be that black/femme/fat/queer. 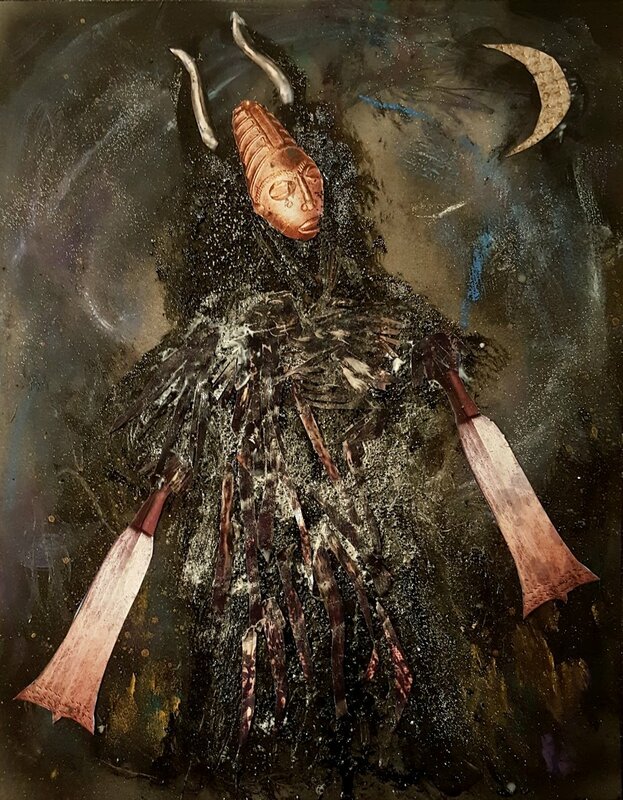 Through paint and collage, much like her Tarot deck, Courtney explores these intersections of self. Her sculptural pieces, which she plans on returning to, are very much identity politics. With her enveloping love of self, she captures the essence of her femme and fat body with deep compassion, grace, and strength. In so much as we salivate at the opportunity to relish and represent the grit of our struggle, it is refreshing to see the beauty of it all. That beauty is reflected in something of a transcendence of all of the things that make one question their intersections. At the outset, it appears that Alexander, now thirty years old, has already transcended the majority of the impact of an unawoke country. But then, this can only be confirmed by the passing of time. Specifically when I speak of transcendence, the material is primarily in this existence, however, the calling is truly spiritual. This is of key importance because, one, the material is heavy; the perception of gender reality; the idea of what is feminine; blackness; what it means to be in a fat body; queerness, and all of this from an introspection, extrospection, and perspective conscious observation. Secondly, when the calling is spiritual and you really do the work, all of that anger, sadness, melancholy, fear, and insecurity is being cleansed in a great act of transcending all that you have recognized as keeping you from an unknown something. That unknown something you know with your heart would see you living a life more aligned with who you imagine your self to be without all of these socio-cultural impediments. This is an act of innocence, an exact opposite of transgressing, and in that exactitude propels itself from the interior to the exterior. The innocence manifests. Which then places Courtney Alexander among the persons (artists) who would take this journey with utmost dignity and authenticity. Courtney Alexander represents having no guilt for being a queer, black, fat body femme. Instead, they have all become the source of her empowerment. Lucky for us her manifestations are in the form of contemporary art and perhaps can learn something from her journey. As of March 16th, the 2nd Edition Dust II Onyx Tarot Deck has surpassed the 50% mark, and according to the informative website, if in these final 7 days the goal is not met, the campaign will be extended.